The Administration - Users and Privileges tab provides a list of all users and privileges that relate to an active MySQL server instance. 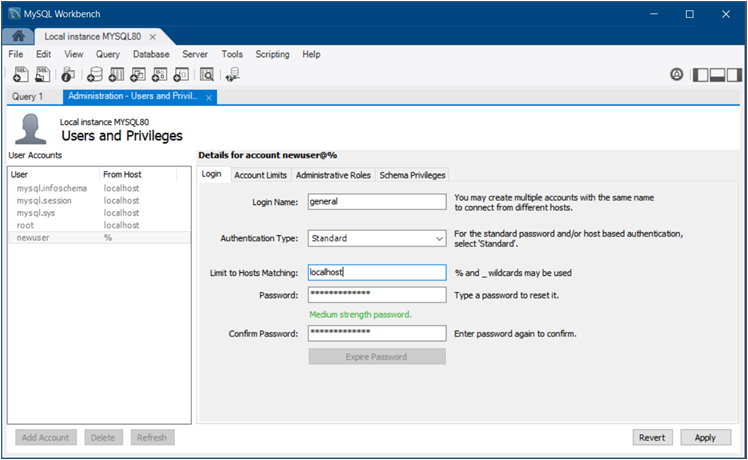 From this tab, you can add and manage user accounts, adjust privileges, and expire passwords. Establish a connection to an active MySQL server instance. Click Users and Privileges from the Management list within the Navigator area. Click Server and then Users and Privileges from the menu. User Accounts consists of a vertical box that lists each user account associated with the active MySQL connection. The list contains each user name and the host name where the account resides. Use the Add Account, Delete, and Refresh buttons to manage the list of user accounts. Selecting an account from the list focuses the account details, which appear in set of tabs, onto the selected user account. The figure that follows shows the layout of the Administration - Users and Privileges tab with the Login detail tab open to show an example of general account information. For a description of the Login, Account Limits, Administrative Roles, and Schema Privileges tabs, see the related sections. Login Name: You may create multiple accounts with the same name to connect from different hosts. Authentication Type: For standard password or host-based authentication, select Standard. The caching_sha2_password and SHA256_Password authentication types provide more secure password encryption than the Standard authentication type. Starting with MySQL 8.0.4, the caching_sha2_password plugin is the default authentication plugin for the server. An account that authenticates with caching_sha2_password must use either a secure connection or an unencrypted connection that supports password exchange using an RSA key pair. Limit to Hosts Matching: The % and _ characters may be used as wildcards. The percent sign (%) matches zero or more characters and the underscore (_) matches a single character. Password and Confirm Password: To reset a password, type in the new password and then confirm it. Consider using a password of eight or more characters with mixed-case letters, numbers, and punctuation marks. Use Expire Password to require a change of password to use the account. Max. Queries: The number of queries the account can execute within one hour. Max. Updates: The number of updates the account can execute within one hour. Max. Connections: The number of times the account can connect to the server within an hour. Concurrent Connections: The number of simultaneous connections to the server the account can have. Roles are a quick way of granting a set of privileges to a user, based on the work the user must carry out on the server. It is also possible to assign multiple roles to a user account or to assign privileges directly to an account without first assigning roles. DBA: Grants the rights to perform all tasks. MaintenanceAdmin: Grants rights to maintain the server. ProcessAdmin: Grants rights to assess, monitor, and kill user processes. UserAdmin: Grants rights to create user logins and reset passwords. SecurityAdmin: Grants rights to manage logins and grant and revoke server privileges. MonitorAdmin: Grants the minimum rights to monitor the server. DBManager: Grants full rights on all databases. DBDesigner: Grants rights to create and reverse-engineer any database schema. ReplicationAdmin: Grants rights needed to set up and manage replication. BackupAdmin: Grants minimum rights required to back up any database. Custom: Lists other (custom) privileges that are assigned to the user account. This role is not available for all default accounts, such as root. If you select a user account and then select one or more privileges directly that are outside of any selected roles, the Custom role is added (and selected) to the list of roles. To remove all of the rights assigned to the selected user account, click Revoke All Privileges. All Schema (%) - This rule applies to any schema name. Schemas matching pattern: pattern - Apply this rule to schemas that match the given name or pattern. You may use _ and % as wildcards in the pattern; however, to use the literal value you must escape each wildcard character with a backslash (\) . Selected schema: schema name - Apply the rule to the specific schema name selected from the list. Use Delete Entry to remove an entry and the privileges associated with it from the list. When you click Revoke All Privileges, you are prompted remove all privileges assigned to the selected user account. With an entry selected, mark the individual access rights that apply only to the schema or schemas defined in the entry. The access rights are categorized as Object Rights, DDL Rights, and Other Rights. Each right that you select appears in the Privileges column of the schema entry.